Few plays have a more intoxicatingly, misleadingly chronicled history than Alfred Jarry’s bourgeois-taunting phenomenon Ubu Roi. Mythologised as a violent break in theatre tradition, the moment at which the well-heeled patrons of the boulevard theatre clutched their breasts in shock and the avant-garde was born, the play is remembered above all for sparking a riot at its premiere in 1896, causing it to subsequently be banned from the stage. The truth, as so often when divorced from the sensationalism, is a lot less dramatic: Jarry himself in fact paid a group of friends to cause a ruckus during the performance, intent on provoking a scandal. He certainly succeeded. It’s the sort of gleeful, calculated trouble-making that recalls the stubborn anarchism of adolescence, an association that Cheek By Jowl have taken and run with in their new version of this problematic play. Picking up on Ubu’s own roots in the teenage imagination – the character was initially a grotesque caricature of one of Jarry’s teachers, created for the entertainment of his schoolmates – director Declan Donnellan has negotiated the text’s crude extremes by framing it as fantasy. Here, Ubu’s depraved, monstrous acts become the cruel and frustrated Oedipal imaginings of a teenage boy with a video camera, a fierce psychological shattering of his parents’ stiflingly spotless middle-class existence. Nick Ormerod’s design swathes the Barbican’s Silk Street Theatre in a tyranny of beige and cream; a modern show home dream, its pristinely laid dining table a picture-perfect lesson in entertaining. Père and Mère Ubu are expecting guests, fussing over outfits and re-arranging coffee table nibbles, while their teenage son – a scruffy grey blot on the otherwise unspoiled living room – skulks around with his camera, offering the audience a glimpse into the rest of the gleaming Ubu home. In an intriguing but over-long opening, the eye of the camera lens takes us on a voyeuristic tour of the house, zooming in on even the most immaculate of surfaces to reveal tiny, tainting traces of human filth: a single dark hair buried in the bedclothes, a smudged lipstick stain on the rim of a glass, a slender speck of dirt on the shiny white toilet seat. As the creator of Ubu well knew, you can never quite banish the muck of human life. Once the production has laboured to provide us with this frame, the action as we know it can begin, the infamous opening “merdre” spluttered out in an extended frenzy of anticipation. With Ubu’s story of ruthless, inane power-grabbing underway, its grotesquely cartoonish excesses are given free rein, all the while skewering the empty social rituals of the familiar dinner party environment it punctures. 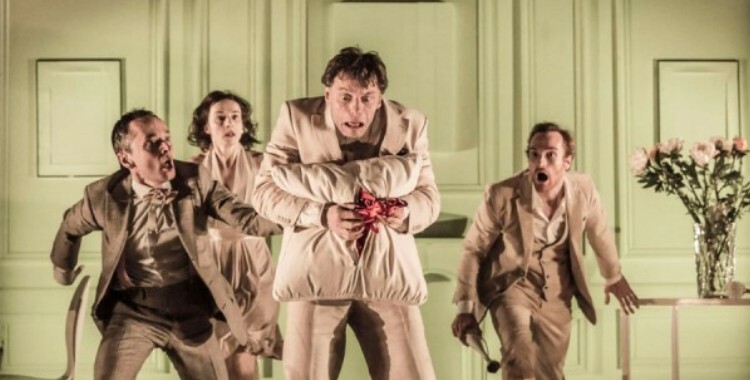 Christophe Grégoire’s increasingly monstrous, gurning Ubu might be the gargoyle everyone expects, but the precise physical detail put into the performances by Cheek By Jowl’s excellent French ensemble elevates the ridiculous spectacle of the anti-hero’s rise and fall. There is also room for some witty added touches; a jibe at bankers allows the audience to titter without losing the accusatory sting that Jarry was first aiming for, while the medium of the video camera allows for a few grinning sideswipes at Hollywood’s stylistic clichés. Even as precisely and intelligently handled as here, however, Ubu Roi remains a heavy burden to heft onto the stage, and after more than an hour of clowning its brashness begins to grate. But it is the main narrative’s framing mirror image that – as well as producing the greatest laughs – becomes increasingly disturbing throughout the play’s descent into mess and depravity. With their magnolia haven in tatters around them, Ubu’s disruptive work done, the dinner guests sit serenely in the midst of the destruction, their small talk blithely continuing. Knowingly placed as it is at the heart of London’s financial district, it is hard not to read this fatal stasis as a bitter metaphor. Perhaps the savage power of Jarry’s play now lies not in its supposed ability to start a riot, but in the fact that no riot is breaking out.